Cannabidiol has a wealth of therapeutic benefits. Here’s why you need more CBD in your life and how to find the best CBDLuxe products. In today’s cannabis friendly world, the one word you’re hearing time and again is CBD. CBD is the nonpsychoactive component of the cannabis plant. Doctors have found that CBD has strong anti-inflammatory, antispasmodic and anti-anxiety properties. But where do I purchase CBD? What products are available? Why is CBD right for me? Here is the how, what, and why. Cannabidiol (CBD) is a nonpsychoactive component of the cannabis plant. While psychoactive cannabis is federally illegal, new laws allow consumers to CBD extractions that contain less than 0.3% THC. THC is the component that produces the cannabis “high”. Cannabis without THC is classified as hemp and is legal in all 50 states. Based on these laws, companies like BE LABS the makers of CBDLuxe can offer pharmaceutical-grade, organic, non-GMO CBD products online and in stores to consumers all over the country. CBDLuxe is third-party tested to ensure the quality, purity, and safety of all their products. All of their products were designed with the highest standards in mind, from their Sublingual/topical sprays to their disposable vapor pens, which are comprised of proprietary blends of CBD and terpene-rich essential oils. The therapeutic applications and beneficial effects of CBD are broad and deep. The National Institute of Health (NIH) has shown through extensive pre-clinical research that CBD has powerful anti-inflammatory properties, relieving a myriad of symptoms caused by inflammation. The NIH has also shown that CBD has tremendous anti-anxiety potential as well. In anecdotal cases, consumers often report feeling relaxed and relieved of stress and anxiety after consumption. Other studies show CBD promotes the growth of new brain cells. More research still articulates that CBD potentially aids in the treatment and prevention of age-related illness such as Alzheimer’s, neurodegenerative disorders, and certain types of cancers. For Will A. Spillo, co-founder of BE LABS, it was pain relief that led him to CBD. Being an international heli-ski guide and big moutain snowboarder has exacted its toll on my body. […] the key reason we developed our line of products was, at first, purely selfish. But, after experiencing first hand how CBD also brought relief to my friends, we decided to bring our proprietary solution directly to a much wider audience of consumers. How do I obtain CBDLuxe? CBD is available both online and in retail locations. 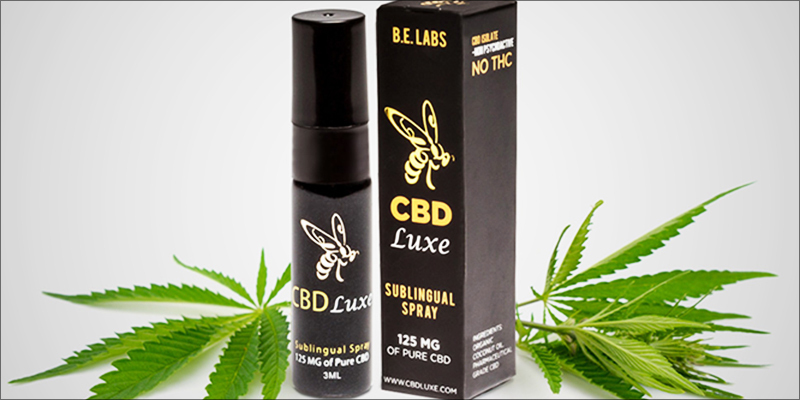 From disposable Vapor pens to Sublingual and Topical sprays CBDLuxe offers a variety of products at competitive prices. CBDLuxe Vapor pens are a proprietary blend of pharmaceutical-grade CBD mixed with terpene-rich essential oils to enhance the three main properties of CBD. BE CALM – A pleasant blend of chamomile, valerian, lavender and CBD to calm, relax and provide stress relief. BE ALERT-A flavor rich combination of Persian lime, lemon, and ginger to keep the user focused, alert and ready for the day. BE CLEAR– A potent blend of peppermint and CBD to relieve nausea and a variety of discomforting ailments. Go to cbdluxe.com to receive their Buy 2 Get 1 Free deal today (make sure to have three items in the cart, plug in the coupon code in the coupon section on the checkout page and voila! Instant discounts on their vape pens and sublingual sprays!